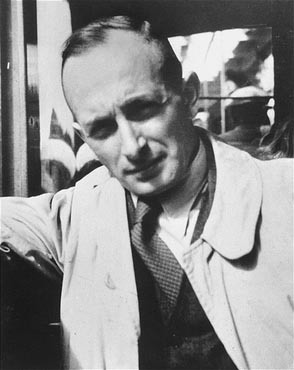 In 1934, Adolf Eichmann was appointed to the Jewish section of the “security services” of the SS. From then on, he became deeply involved with the formulation and operation of the “final solution to the Jewish question.” He drew up the idea of deportation of Jews into ghettos, and went about concentrating Jews in isolated areas with murderous efficiency. He took great pride in the role he played in the death of 6 million mainly European Jews. A number of the top Nazis were captured after the war and tried at Nuremberg. Many escaped. Some were sought out by members of the Jewish Brigade of the British Army. In addition to assisting in the illegal immigration of Jews to Palestine, they also organized themselves into a group dedicated to tracking down Nazis. They called themselves the “Nokmim” – the Avengers. They located and captured hundreds of SS men, especially those involved with the running of concentration camps. When Eichmann arrived in Argentina in 1950, he lived for almost three years in a quiet town near Buenos Aires called San Fernando, where he worked in a metal factory. He then moved to the province of Tucuman, located over 600 miles from Buenos Aires, where he worked at an engineering company called the Capri firm, to which Juan Peron, the Argentine president and known Nazi-sympathizer, gave many state contracts to modernize the province’s water administration. Eichmann’s wife and two children arrived in Argentina in mid-1952, and accompanied him to Tucuman. He registered his two children at a German school, known to promote anti-Semitic and pro-Nazi propaganda at the time, under the name Eichmann, suggesting again how the Argentine government aided and abetted former Nazis and their sympathizers. In April 1953, the Capri firm declared bankruptcy and Eichmann moved his family to Buenos Aires. He was hired by Mercedes Benz in March 1959, where he continued to use the alias Ricardo Klement. No one had heard him for years. But in the autumn of 1957, Walter Eytan at the Israeli Foreign Ministry, got a call from Fritz Bauer, the public prosecutor of the province of Hesse, Germany. Bauer told Eytan that Eichmann was alive and living in Argentina. Harel decided this man must be brought to justice and punished for his crimes; the victims of his slaughter demanded it; justice and morality demanded it; but no one was looking for him – no agency, no government, no police force. Until the Mossad took over. It was not going to be an easy task. Eichmann was certainly living under an assumed identity, and had friends in and out of the Argentinian government. Moreover, Harel decided it was preferable to capture Eichmann rather than kill him in the style of the Avengers. He was going to bring him to Israel and make him stand trial before the people he tried to exterminate. Harel asked Prime Minister David Ben-Gurion for the go-ahead. Ben-Gurion gave it. And thus the operational machinery of searching for Eichmann went into effect. They had slim leads at first, but there were clues. One of Eichmann’s supposed sons, Nicholas, had gotten involved with an Argentinian Jewish girl and, apparently not knowing she was Jewish, boasted about his father’s role in the killing of the Jews of Europe. He had mentioned that it would have been better if the Nazis had “finished the job” during World War II. Nicholas Eichmann also used the family name Eichmann openly at times. The Mossad followed up on the tip. But when they checked the old address of what was supposed to have been Eichmann’s house, he no longer lived there. That lead didn’t go anywhere, other than clarifying that one of Eichmann’s sons was indeed in Argentina with Adolf Eichmann. But the investigation still moved slowly and delicately. “The investigators could not risk the danger that their prey would learn he was being followed. Even more difficult was the necessity of identifying their man beyond the slightest doubt. The only thing worse than losing the real Eichmann would be capturing the wrong one.” But investigators had a very difficult task. Eichmann had carefully destroyed all evidence of his former identity. He had even removed the tattoo all SS men had under their left armpit. All the investigators had were blurred pictures before the war. No fingerprints were available. In late 1959, the Israelis discovered that Eichmann had changed his name after the war to Ricardo Klement. He was on the way to Argentina when he did so. The Mossad team followed the trail of Eichmann’s son and was led to Garibaldi Street in the San Fernando section of Buenos Aires. “They surveyed the house constantly, photographing it from every angle with a telephoto lens, making notes about its lack of a fence, its fiberboard door, its unplastered walls. They observed the habits of the balding, bespectacled man who lived there with his family. They felt certain he must be Eichmann. But they still didn’t have the proof. On March 21, 1960, the agents got their proof. That evening, Ricardo Klement got off the bus “and walked slowly toward his home. In his hands was a bouquet of flowers.” Klement gave the bouquet to the woman who greeted him at the door. Their children were dressed for a special occasion. Later they heard the sound of laughter, of people in a celebratory mood. March 21 was the date of the Eichmann’s silver wedding anniversary. There were no more doubts. In May 1960, Argentina would be celebrating its 150th year of independence. Additional Israeli operatives were sent to Argentina in connection with the larger number of people who would be on hand for the country’s anniversary. Each man was handpicked by Harel for his or her special qualities developed and proven over years of undercover intelligence work. All had risked their lives in Arab and other countries. Each one could be trusted and depended on in times of crisis. The leader of the group had proved his mettle helping illegal Jewish immigrants land on the Palestine shores under the vigilant eyes of the British. He later took direct action against the British himself. He had also fought Arab marauders and had been wounded. He later joined Harel’s Mossad. All the others had survived Nazi persecution. Most of them had seen most, if not all, of their families wiped out in Nazi concentration camps. The man who was chosen to grab and overpower Eichmann had lost his sister and her three children at the hands of the Nazis. He would finally get his chance to do his part in avenging them, to whatever extent he could. Altogether, there were more than 30 members of the team. “Nothing was left to chance. To ensure that there were no problems with documents, plane connections, visas, health certificates, character references for the unit, a miniature travel agency was set up by the Mossad” in an unidentified European city. They tried hard not to leave the impression that they would be operating from Israel. Harel knew Israel would be violating Argentinian sovereignty by kidnapping Eichmann and taking him out of the country. In addition, given Argentina’s role as a haven for Nazis and their sympathizers, he feared the government would make things difficult if they knew what was afoot. Israeli agents began to fly in from all over the globe ostensibly for Argentina’s 150th anniversary celebrations. No two came from the same city. They rented safe houses and constantly changed cars to throw off anybody who might be watching them or who would get suspicious. On May 11, Mossad operatives were ready to move into action. They knew Eichmann was home from work at about 7:40 p.m. They were there at 7:35. Two Mossad operatives tinkered with the engine of their car. Another car was parked about 30 yards behind the first one, and the passengers were also tinkering with their engine. A bicyclist stopped and offered to assist them in their efforts to fix their car. He must have been surprised when they politely but firmly refused his offer. Two buses came and passed, but Eichmann “didn’t alight from either of them. The men lying in wait began to get a little worried. Could it be that he had come back early that day and was home already? Perhaps he wasn’t coming at all?” Four days had passed since they had observed Eichmann last; they began to wonder if he had changed his routine. Another bus passed. Eichmann was not in it. Although they began to question whether he would arrive, nobody gave voice to their doubts. Eight o’clock came. This was some time after Eichmann usually arrived, and some of the Mossad operatives thought they should abort the mission. They didn’t want to “risk spoiling their chances of putting their plan into action another day.” However, without telling the others, the leader, Gabi, had decided to wait until 8:30 p.m. In the second car, Ehud, had decided to continue waiting as well – although neither Gabi nor Ehud had communicated his thoughts to the other. At five minutes after 8 another bus pulled up. A man began walking toward Garibaldi Street. The Mossad man in the first car recognized Eichmann immediately; in the other car, they recognized him 15 seconds later. They drove to their safe house and parked in the garage. It was 8:55 – 50 minutes after his bus had arrived. Eichmann was taken into the house and shackled one of his legs to a bed frame. They took off his clothes and put pajamas on him. They checked in his mouth for poison to be sure he would not try to kill himself as other Nazis had done to avoid being tried. The Mossad team could hardly believe that such a monstrous criminal could look so unexceptional. But that was not just their impression; everyone who saw him was amazed at his ordinary appearance. They expected him to look more sinister, more imposing, but he appeared harmless. They kept him for a week in a room in a safe house, never letting him out of their sight. They had to plan the next phase – getting him out of Argentina. They had arranged for an El-Al plane to leave Buenos Aires on May 20. Its departure could not be advanced for fear of arousing the suspicions of the Argentinian authorities. Harel was almost alone among Mossad operatives who felt that Eichmann’s family would not make a public fuss about the father and husband who had gone missing. Harel was convinced the family would not announce his disappearance for fear his true identity would be revealed and they would lose public support. His Nazi associates also had to remain silent to avoid being exposed. His family did call hospitals and clinics, but avoided calling the police. They contacted their friends but none were willing to help. “Most of them ran for their lives and scattered all over the continent. Some even headed for Europe – just in case the group who had seized Hitler’s henchman were also on their tracks.” They assumed the Israelis had gone to all the effort to seek out and capture Eichmann in South America and worried the Israelis might invest the same resolve to trap them. The Mossad still had to take Eichmann out of the country without arousing the suspicions of the Argentinian authorities. They sent one of their agents into a local hospital with the claim that he had suffered brain damage in an accident. He was supposed to exhibit gradual progress. On the morning of May 20, the patient had recovered sufficiently to fly home to his native Israel. The Mossad then substituted Eichmann’s name and photograph for the patient’s. Eichmann was drugged so that his senses would be blurred when he was brought to the plane and not resist. He could still walk, but needed to be held up by an agent on either side of him. The Mossad men drove in a group of three cars, with Eichmann in the second, to the airport. The men in the first car “began singing and laughing as they approached the guard house entrance. The driver embarrassingly explained that the men had enjoyed themselves so much that some were still dozing off. The guard didn’t question the ruse. Two Mossad members took the half-conscious Eichmann aboard the plane. Many of the crew were disturbed to learn Eichmann was aboard the plane. Harel made sure throughout the operation that no one threatened or manhandled him. Several acts of revenge were plotted by Nazi sympathizers in Argentina following Eichmann’s abduction, including kidnapping the Israeli ambassador and bombing the Israeli Embassy, though neither came to fruition, according to researcher and author Uki Goni. One incident that did occur was an attack on Jewish students in the Legions National Pimientos by a young group of Argentine Nazis called the “Huaraches” on August 17, 1960. They fired several shots and wounded a 15-year-old student named Edgardo Vilnius. On July 12, 1950, two months after Eichmann’s abduction, his wife Veronica went to the Argentine Federal Court and denounced her husband’s kidnapping and provided documents showing Eichmann’s entry into Argentina. In her statement, to the Court, she proclaimed, “I understand that with this declaration I am undeniably admitting that Ricardo Klement is Adolf Eichmann. For the record, let it be known that he does not deny his name and he will confront his responsibility as I have assumed mine by bringing the knowledge of the occurrences to the courts.” The Argentine court reviewed her complaint that her husband was denied due process, but dismissed it at the end of 1962 because they were unable to identify Eichmann’s kidnappers. 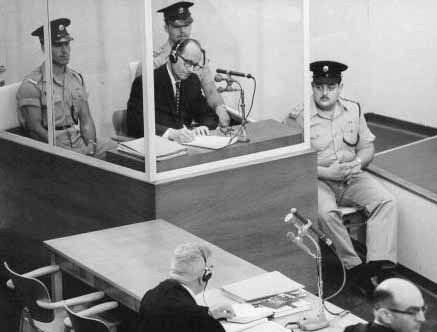 Eichmann stood trial before an Israeli court in 1961. The trial, with the recounting of the ghastly crimes the Nazis perpetrated against the Jews, brought out a tumultuous emotional response among the Israeli public and the Jewish people as a whole. Memories that had been repressed burst forth in the courtroom. People screamed and cried and wanted to attack and kill Eichmann who appeared in court inside a bulletproof glass box. The whole story of Eichmann’s directing the “final solution” came out into the open. He asked for understanding and mercy from the Jewish people – claiming that he had acted “under orders,” that he was just a “cog in the machine,” and that it was the Nazi government’s fault, not his, for what had been perpetrated on the Jewish people. Eichmann did not receive sympathy and was convicted for his war crimes and hanged in 1961. Finally, a persecutor of the Jewish people had been forced to stand trial and had been condemned by a Jewish court – a court of the state of Israel. After many centuries, those who had freely humiliated, ostracized, deported, expelled, and murdered Jews would be answerable for their crimes. The Jews now had a nation, and an army, and a very efficient intelligence service to look after their interests no matter where they lived. Twenty-one days after Eichmann’s execution, unrest in Argentina over the incident flared. In June 1962, nationalist extremists abducted a 19-year-old Jewish girl, tortured her, and scarred her with swastikas. Israeli Prime Minister David Ben-Gurion was revered as a hero in the Jewish community in Buenos Aires while the Argentine government complained about Israel’s actions to the UN. The government was pressured by the nationalist-right to sever diplomatic ties with Israel, and the Israeli ambassador was indeed expelled for a brief time. Four months later, tensions between the two countries simmered down and relations returned to normal. The Mossad did not officially acknowledge its involvement in Eichmann’s abduction until February 2005. Diego Melamed, Dubious Refuge, Jerusalem Report, (August 6, 2007).